A FRONTLINE animal rescuer reveals the shocking distress of saving stricken animals in tense scenes filmed for television. 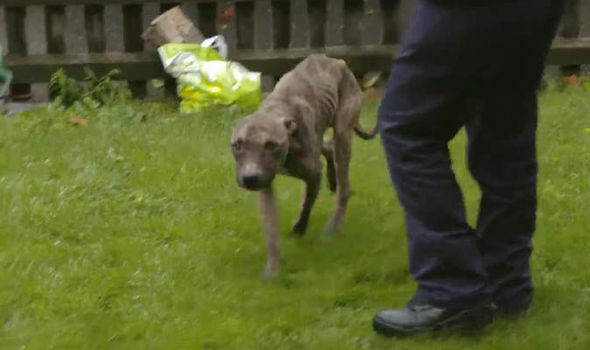 RSPCA Inspector Herchy Boal tells cameras how she is left wanting to scream and shout to get over the upset after rescuing two “skin and bones” dogs. In a dramatic insight into the impact cases can have on even the most seasoned animal welfare workers, Inspector Boal admits she needs to get the heartbreak out of her system. Scenes filmed for the latest episode of Channel 5’s The Dog Rescuers show the RSPCA officer looking visibly shocked as she takes two Staffie crosses to the vets after receiving a tip-off about their condition. With the dogs, black-coated Bentley and brindle Rocky, safely in her van, the RSPCA inspector says she wants to “scream and shout” at the owners because the dogs are so underweight. “Why would you allow those dogs to look like that, why would you ignore that?” She asks as the cameras focus on the two pets. Veterinary checks later show Bentley weighed 12.6kg and Rocky 12.2kg where, by rights, they should each weigh around 20kg. Cameras followed Inspector Boal after a worried member of the public reported seeing the terriers that were so thin it was possible to count all their spinal bones. After confronting two men and arranging to take the dogs for veterinary checks, Inspector Boal explains: “Regardless of whether this is a medical problem or whether this is underfeeding it’s one of the two. The men, who say they adopted dogs after their mother died but could not cope, are later given written cautions to due personal mitigating personal circumstances. For both dogs, the incident has meant starting new lives with adoptive families. Bentley was rehomed by Nicky Wilson, partner Colin and son Aidan from Bishops Cleeve, Cheltenham. Inspector Boal’s case features on Channel 5’s The Dog Rescuers on August 7 at 8pm.